While walking through the St. Lawrence Market district, you don’t expect to be transported into a Moroccan café with an ornate interior, gorgeous light fixtures and soothing green palm fronds. Café Moroc, located in the bar area of the Sultan’s Tent, is calming and inviting. During weekday lunches, the hushed environment is completely different from the jovial belly dancing dinners at the adjoining restaurant. It’s relaxing and serene; I get an urge to do yoga, followed by a visit to the café for couscous and mint tea. 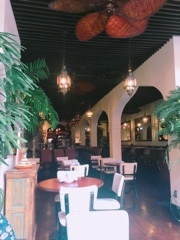 Unlike most downtown establishments, Café Moroc doesn’t offer a special lunch menu. Combine that with their pricy a la carte, we practically had the entire dining room to ourselves during a Friday lunch. We had our choice of tables and the gentlemen working that afternoon was so friendly and attentive that I felt like Moroccan royalty. For the price conscious, you can still visit the gorgeous space for less, just order a couple of appetizers. 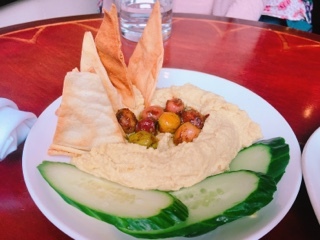 The hummus and pita ($10) is a fair sized portion – the dip is thick and flavourful, with a splash of olive oil to dilute everything a bit. It would have been preferable to provide patrons a mixture of crispy and soft pitas, as the hard pita is so brittle that eating the hummus cleanly can be a challenge. 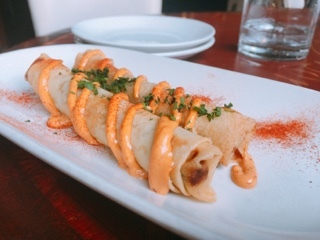 Don’t worry about the skimpy portion of bread that’s presented; afterwards, our waiter brought out another plate piled high with them so we could dip to our heart’s content. Having had the starter over a decade ago, I remembered the signature maftoul ($10) being tastier. The phyllo wrapped Moroccan ‘cigars’ are filled with ground beef, raisins and cashews before being fried. If you like spring rolls, these are similar. Perhaps my palette has matured, but the filling seems less spiced and subdued. It’s more like a crispy package of cumin infused ground beef than the ‘exotic’ dish I remembered so fondly. Nonetheless, they’re still enjoyable. 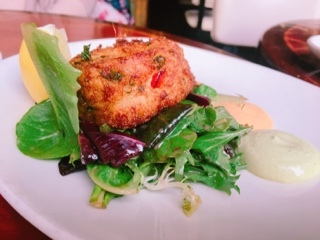 Despite the meagre portion, Café Moroc’s crab cake ($14) is delicious – it incorporates enough crab and the recipe is differentiated from the typical North American coastal creation by the stronger Moroccan spices used in the filling. The crab cake is so flavourful that you don’t even need the citrusy chermoula emulsion or spicy harissa aioli that accompanies it. Having had a great tagine in Montreal, their short rib version ($29) seemed like an ideal choice. The meat was thankfully left on the bone (the bone provides so much flavour!) and was succulent and nicely flavoured from the thick demi-glace. In lieu of couscous, I asked the grain to be switched with saffron rice. Despite the vibrant yellow hue of the rice, there wasn’t any saffron essence at all – that lovely almost shellfish like aroma that wafts through – what a disappointment. Overall, it was a decent interpretation of the dish, but not nearly as aromatic as it should be … somehow it seems each element is cooked separately and then re-assembled and presented in the tagine, rather than cooked in the vessel. 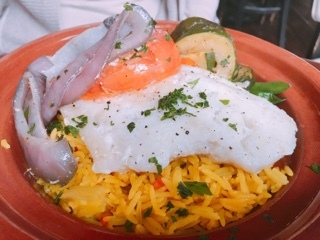 Café Moroc also offers a fish tagine, which changes and happened to be cod ($29) that afternoon. Its flavours pales in comparison. The protein, while moist and flakey, lacked any seasoning making the overall dish bland. Perhaps, it’s due to all the strong appetizers and my own hearty short rib, but after such an exciting start for my taste buds, the fish tagine was so boring. 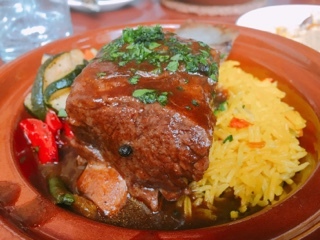 It’s a shame the main dishes at Café Moroc are so tame. Where are the enticing aromas or bursts of flavours to excite your taste buds? While I loved the atmosphere and service at the restaurant, you can’t help but leave feeling you’ve visited a tourist trap. If I ever return, I’ll definitely just stick with the appetizers. After all, nibbling on finger foods and digging into a plate of thick hummus would be more fitting of a Moroccan café any day.